I'm helping my co-worker sell some of her doll. I spent hours today taking photos and descriptions of their conditions. 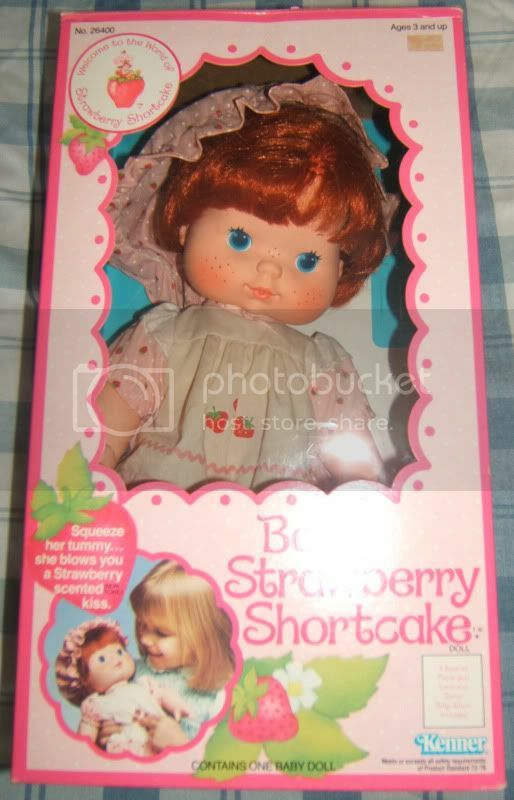 All 3 Kenner Strawberry Shortcake blow kiss baby dolls come with their boxes, all their clothing (most of the elastic needs replaced though), all the boxes have a very small part cut out the top (was there some kind of berry points or something there?). They are from 1982 or at least that what it says on the box for the copyright. The three dolls are Strawberry Shortcake, Lemon Meringue, and Baby Apricot. 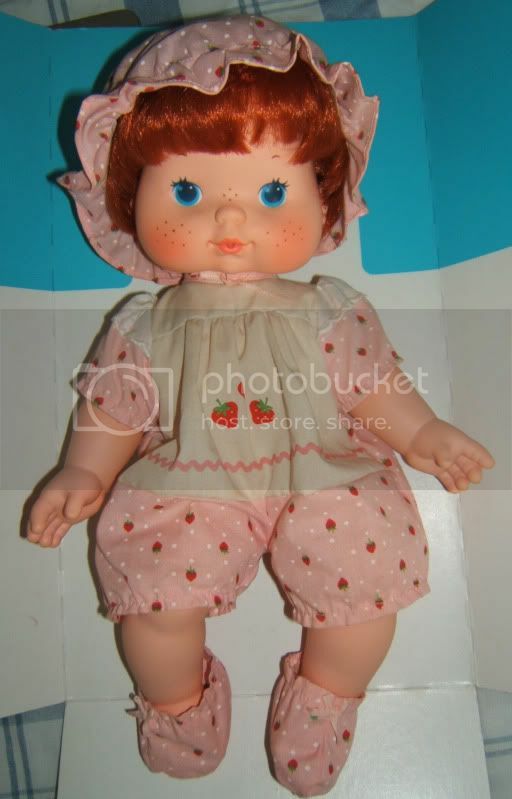 Strawberry Shortcake doll is in excellent condition besides the fact that the elastic needs replaced (happens so easy to elastic as it ages). She sadly doesn't smell like Strawberries anymore. Lemon Meringue is in good shape. Her clothing needs most of the elastic replaced too. 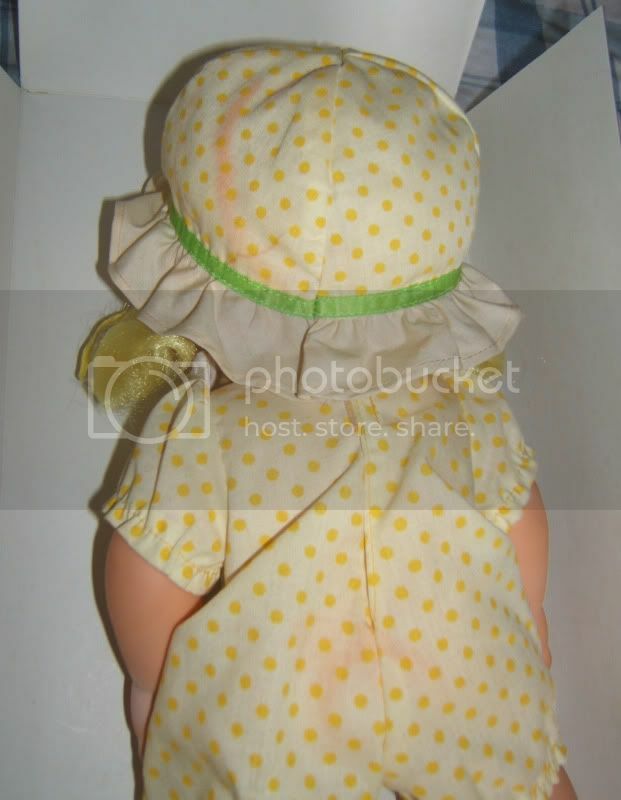 There are a few light pink staining on the backside of her clothing on her hat and her rear. 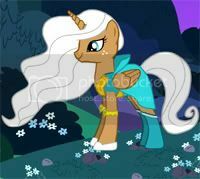 Her embordary on the front needs to be reglued on the sides. She also has a few light spots on her skin on her leg and her arm. She has the original ribbons in her hair. 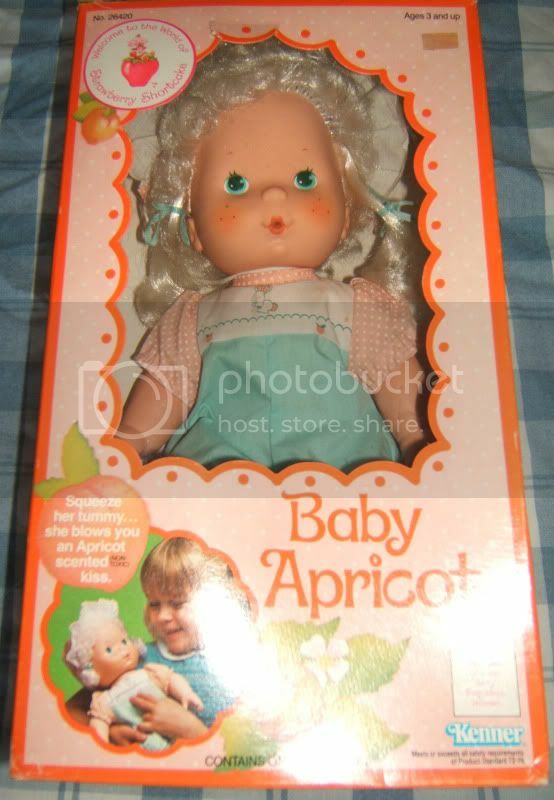 Baby Apricot is in excellent shape. Her clothing looks nice but there is a few tiny stains on the top of her outfit on the white part. She still smells like apricots! Her elastic needs replaced too. She has the original ribbons in her hair. The window of her box is coming loose and needs to be reglued down. All the dolls have been opened to be displayed on a shelf and then were put back into storage. Will take offers on them since I'm not sure what to price them at. Anybody who thinks they can help me put a price on these please help me! Thanks! I just bought Strawberry shortcake with box in similar condition for AU$35.81 but the pirce might be different in the US. Thanks for your help Mouse. If anybody is interested in them send me a PM. Buy one or all if you like. 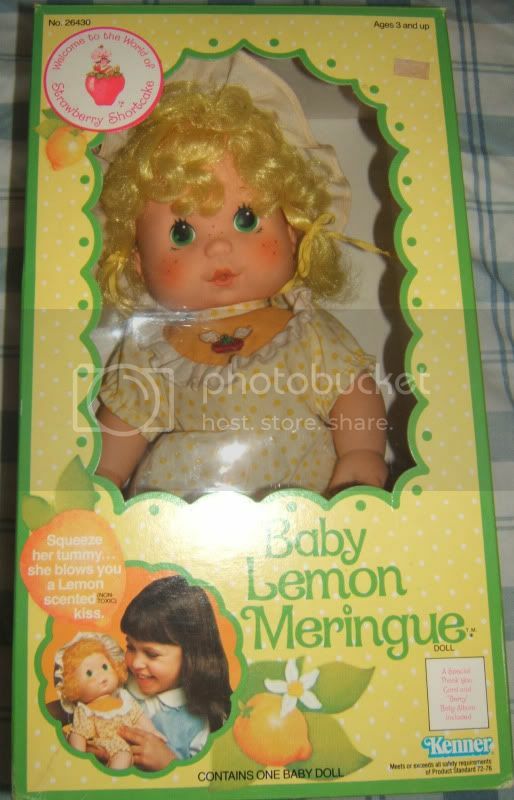 Bit off topic but did they do small versions of these cos when I was little I had two dolls that smelt of fruit they were about 10cm big one had blue hair and one red but the red haired one looked almost exactly like your big SS doll. They never had clothes because I got them second hand. yes, you can see examples on Ghosts Strawberry Shortcake toys section. I'm new to this site and ran across your post. It's been a while. Did you sell the dolls? Hi! My name is Karinne. 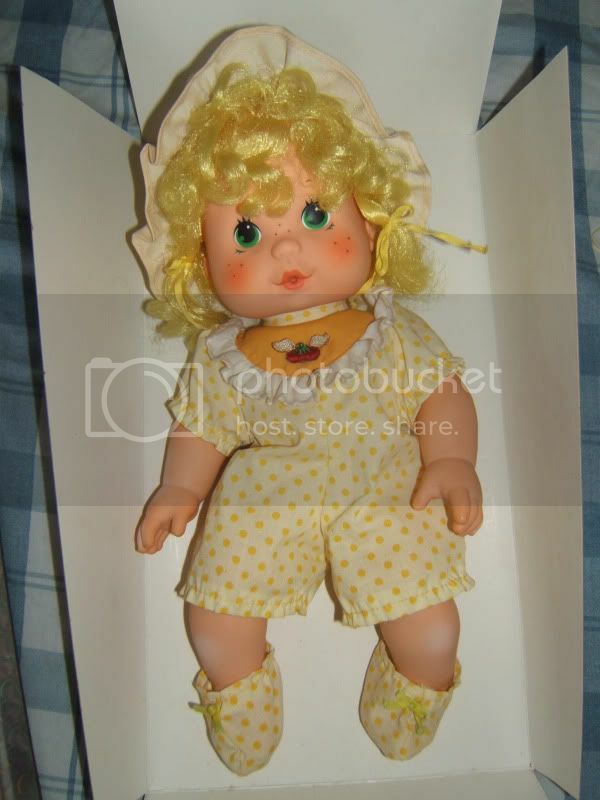 I've been looking for this doll for a while. Would you be willing to take $100.00 US dollars? I would pay extra for shipping. 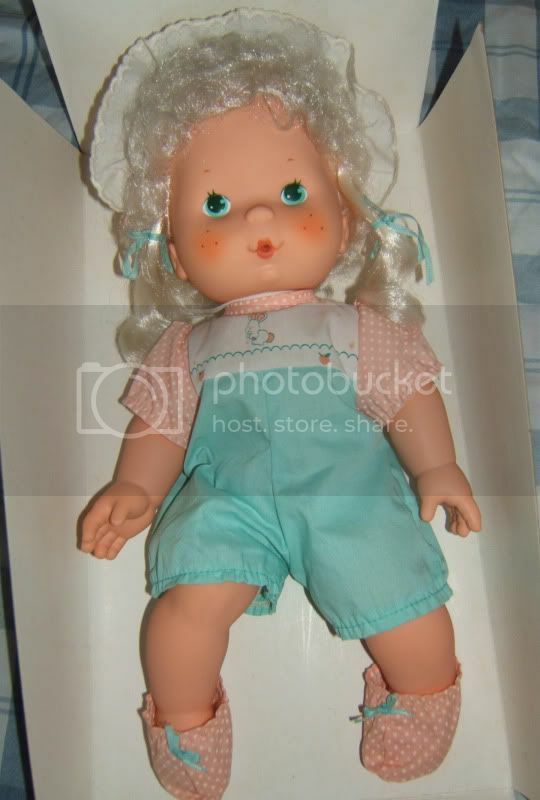 I had this very doll when I was little and sadly she was thrown away when I was moving out of childhood home after my parents divorce. I've been searching her in the box and was so I excited to see your page. I have an account with paypal. Do you accept paypal? My email address is Karinneg8@yahoo if its easier for you. I look forward to speaking with you. Have a great night.